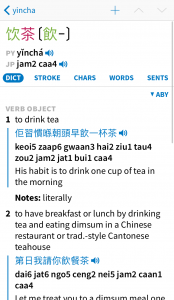 We’re pleased to announce that the ABC Cantonese dictionary is now available in our iOS + Android apps. 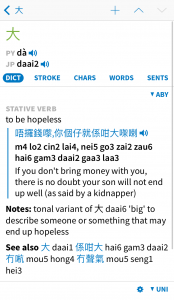 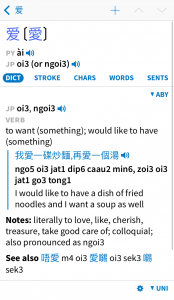 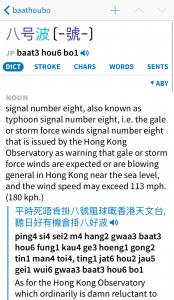 This brand new Cantonese-to-English dictionary – the first in several decades – features 15,000 Cantonese-specific vocabulary entries and a whopping 16,000 Cantonese example sentences, all with Jyutping/Yale pronunciation. 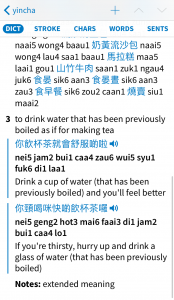 It was authored by the great Professor Robert S. Bauer of HKU and produced by Wenlin Institute (who offer a web-based version of it themselves for easy use on PC and Mac). 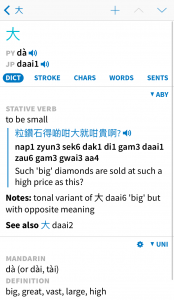 You can buy it right now for $29.99 through the “Add-ons” screen in our iOS and Android apps, or from our website store at store.pleco.com (direct purchase links: iOS / Android). 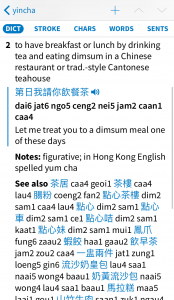 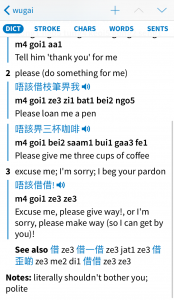 We’ve also launched two new Cantonese text-to-speech voices, Kayan and Kaho – also available in “Add-ons” – which you can use to hear headwords and examples from this (and any other Pleco dictionary) read out loud in Cantonese.